In version 4.5 I want to use Optitex cloths but I dont found the Dynamic Clothing Tab. You should find the tab in Window > Tabs > Dynamic Clothing. The basic control comes as part of DS4.5 Pro, you should not install the plugin unless you have bought it from the store, as the seperate download is for the paid for version. Does your version of DAZ Studio say 'DAZ Studio 4.5 Pro' in the title bar, if not, you will have to enter the Pro serial number using Help > Register DAZ Studio. 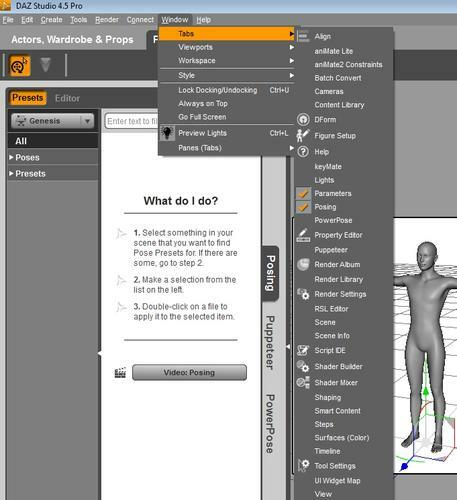 I have DS4.5 Pro in the title but not the tab in Window > Tabs > Dynamic Clothing as you can see in attachment picture. Perhaps I do install the news version 4.5.1.56 ? You should probably upgrade to the latest version anyway, 4.5.1.56. When you install that version, it will uninstall the previous version for you, but DO NOT download and install the Dynamic Clothing Control Plugin seperately unless you have bought it, and have a serial number for it. The DCC comes as part of the main installation. You could look now in Help > About Installed Plugins, and it should tell you if it has installed properly or not, but it is probably better to install the upgrade anyway. Yeah I agree with Jimmy if you have the Plug-in and serial number (The serial for the DS3 Dynamic Clothing Contol plug-in will do) and you installed it and it is not showing up in the Panes list then I would have to guess you didn't enter the serial for the plug-in which can be do in Help > About Installed Plug-ins. Effectly, I have try to install the Dynamic Colthing Control Plugin, in Help > About Installed Plugins it want a key number. re-install 14812_GenesisStarterEssentials_1.11_trx.exe stop the bug or .... ?? Basically all you need to do is update any Genesis related morphs products you may have pruchased (not Genesis 14812_GenesisStarterEssentials_1.11_trx.exe) but other ones.